The Michigan Department of Natural Resources utilizes a number of approaches to manage for biodiversity on the 4-million-acre State Forest system. This presentation will review the breadth of programs and tools used by managers to protect and improve rare natural communities and rare species on State Forest lands. Keith Kintigh is a Forest Conservation and Certification Specialist for the Michigan DNR in Gaylord. 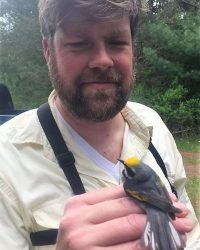 He works primarily on rare species and rare natural communities and sustainable forest certification of Michigan's State Forests. He holds degrees in Wildlife Ecology from Michigan State and New Mexico State Universities and has worked for the DNR for 18 years.